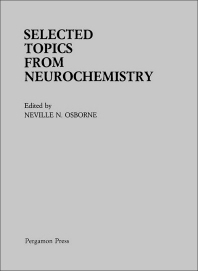 This book contains up-dated versions of articles which proved very popular when first published in Neurochemistry International. The articles draw attention to developments in a specific field perhaps unfamiliar to the reader, collating observations from a wide area which seem to point in a new direction, giving the author's personal view on a controversial topic, or directing soundly based criticism at some widely held dogma or widely used technique in the neurosciences. For neurochemists, neurologists and neuropathologists. (partial) Some fundamental theoretical and practical problems associated with neurochemical techniques in mammalian studies, H Hillman. Metabolic and functional studies on post-mortem human brain, J A Hardy & P R Dodd. Communication between neurones: current concepts, N N Osborne. Possible mechanisms involved in the release and modulation of release of neuroactive agents, J R Cooper & E M Meyer. Cholinergic systems in mammalian brain identified with antibodies against choline acetyltransferase, B H Wainer et al. Neural control of muscle, S R Max & G J Markelonis. Neurochemical aspects of the opioid-induced 'catatonia', U Havemann & K Kuschinsky. Polyamine metabolism and function in brain, N Seiler. Current status of the biogenic amine theory of depression, B E Leonard. GABA and endocrine regulation - relation to neurologic-psychiatric disorders, F V DeFeudis. Central GABA-ergic systems and feeding behavior, F V DeFeudis. GABA and "neurocardiovascular" mechanisms, F V DeFeudis. Effects of psychoactive agents on GABA binding processes, F V DeFeudis.